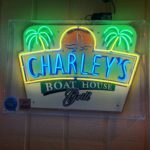 Charley’s Boathouse Grill has been a mainstay on Fort Myers Beach since 1974. Can you imagine how many dinners they have served in 45 years? Over the years we have heard many good things about Charley’s, so we thought we were a bit over due for a visit. Charley’s was converted from an old boathouse into an “Old Florida canal side restaurant”. They are a traditional steak and seafood restaurant. It reminded me of the old Smitty’s restaurant. 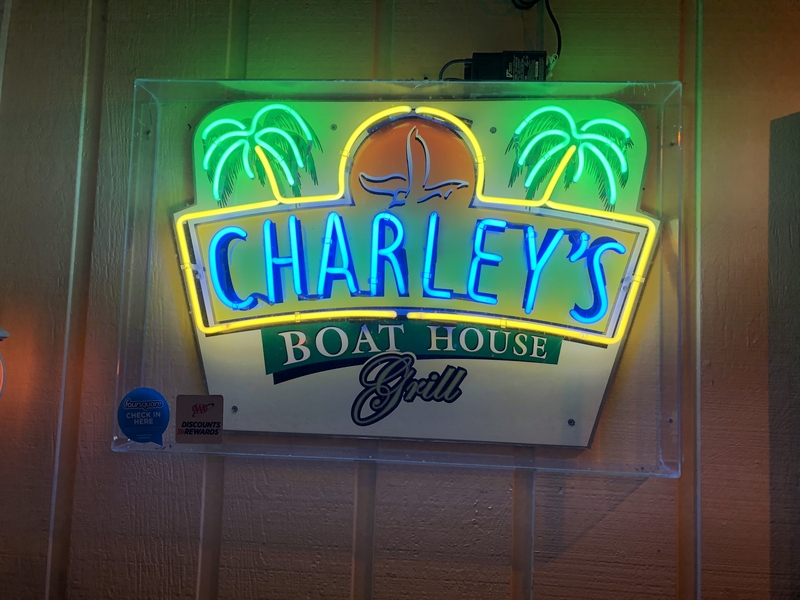 Charley’s Boathouse Grill has a full bar, 2 dining rooms and a huge 55 item salad bar complete with blue jello. I mention the blue jello because our server James emphasized it to us. It was a lovely shade of blue though. 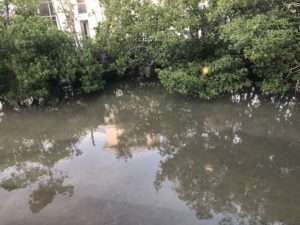 We were seated by a window overlooking the canal. James explained the menu and that the salad bar is included with all entrees and then we had a choice of potatoes options or rice. 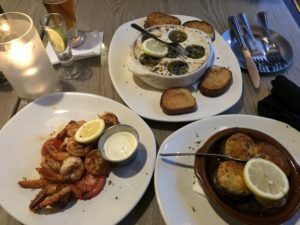 We started with some appetizers of Escargot with button mushrooms, garlic butter and served with crostini ($12), Blackened Shrimp with 8 large shrimp tossed with our blackening spice ($12) and Stuffed Mushroom Caps with crab and cream cheese stuffing ($9). Everything was served hot and was absolutely delicious. Escargot if not cooked properly can be very rubbery but it was perfectly cooked. Then it is was off to the 55 item salad bar. All the items were fresh and there is a wide variety of items. Most items are what you would on a typical salad bar. However, they were all quality items. We did pass on trying the blue jello though. 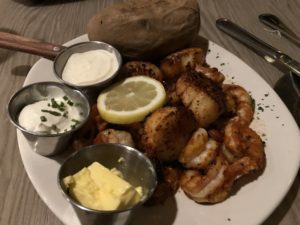 For entrees we settled on the Prime Rib Black Angus (Mate’s Cut $29) with mashed potatoes and the Scallop & Shrimp Blackened ($30) with a baked potato. 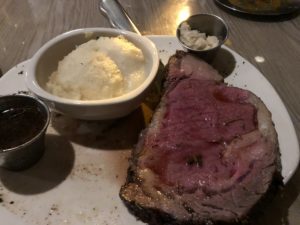 I like my prime rib medium rare and it was a bit too rare for my taste, but I decided to give it a try and it was so tender that it melted in your mouth. The scallops and shrimp were perfection. We had to pass on dessert as we were unable to eat any more. We did have coffee and enjoyed the relaxing atmosphere. 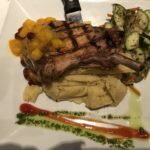 James, our server, was a wealth of knowledge about Fort Myers Beach as he was born and raised there and still lives on the beach. We enjoyed chatting with him as well. While the menu may be considered simple and or dated by some, you just can’t go wrong with steak and seafood. They use quality products and know how to cook each dish perfectly. 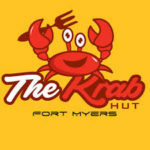 So when you find your self on Fort Myers Beach be sure to give them a try.